Usually you begin the hosting proposal process at least two to three years before the year you want to host. ILDA Conferences in recent years have been in the U.S. or Canada in even years, and outside of North America in odd years. So the first consideration of “when do I want to host” is whether your location would put you in an even year or an odd year. You may want to contact ILDA first, to check with the Executive Director and/or Board to be sure your planned location and approximate dates would be OK. In recent years the ILDA Conference has been held in late October/early November. While ILDA is open to other times, this tends to work out given tradeshow schedules, off-season hotel rates, and other factors. The first formal step in hosting is to present a proposal at the Business Meeting held during the ILDA Conference. This is usually done using PowerPoint slides & video. The presentation is somewhat like a tourism video, telling why people should come to your location. Your local tourism board is a good resource for info, photos and videos that may be helpful. In the presentation, also briefly discuss potential hotels (“We have many fine four-star hotels…”) and post-conference tours (“We can arrange a special tour of local castles…”). Some potential hosts have also handed out brochures and giveaways furnished by the local tourism board. Sometimes two or more potential hosts want to host in the same year. It may turn out that one of them can wait two years for the next cycle to come around. If there continues to be more than one proposal for a given year, the ILDA Board also can a poll or a vote of members. A poll gives the Board guidance; a membership vote is binding on the Board. ILDA will list the host at the website, in banners, and in other marketing materials. The badge-holder ribbon, produced by ILDA, will have the host’s name. The host is free to provide whatever information or display they would like at the Cocktail & Welcome Reception, Lase-Off and Awards Presentation. The host can also make an address to the attendees if they so desire at these events. The welcome reception dinner can be in the hotel or at an alternate venue (ie: dinner cruise); the site will be jointly decided upon by the host and ILDA. ILDA will provide two free Conference registration for the host; this includes all meals and other benefits of a full registration. Any additional employees may attend Conference events by paying the actual food costs ILDA is charged for those events. For example, employees attending the Lase-Off or the Awards will be charged what it costs ILDA to provide the meal. ILDA's main expectation of the host is the production of the Lase-Off and Awards Presentation, under the direction of the ILDA Awards technical director and the general supervision of the Conference chair, Executive Director, and ultimately the Board. The host provides all equipment and labor to set up the show in its entirety in the presentation space (usually a ballroom but it can be an event center). ILDA may make arrangements with a laser projector sponsor. If so, these lasers must be used. If not, then the host is responsible for providing the lasers. The ILDA switcher will be sent in advance. Arrangements must be made for playback computers from the most-used laser systems (example: Pangolin, Lasergraph DSP) to be present as well. The host is responsible for all cabling, unless specifically provided by a laser projector manufacturer, a computer provider, or ILDA (e.g., with the ILDA switcher). The host is also responsible for all A/V. This includes a suitably bright video projector to show the ILDA Award-winning videos, a screen (rear-projection preferred), a podium, a sound system (for the podium, the videos and the laser computers), and suitable lighting for the podium/presentation area and room ambiance. It also includes all pipe-and-drape that may be needed for a professional-looking production. ILDA makes the final selection of the hotel. ILDA is responsible for the hotel costs: meeting rooms, food and beverage, A/V, etc. If the host can provide standard A/V items such as video projectors, screen, sound system, this is welcomed but is not required. 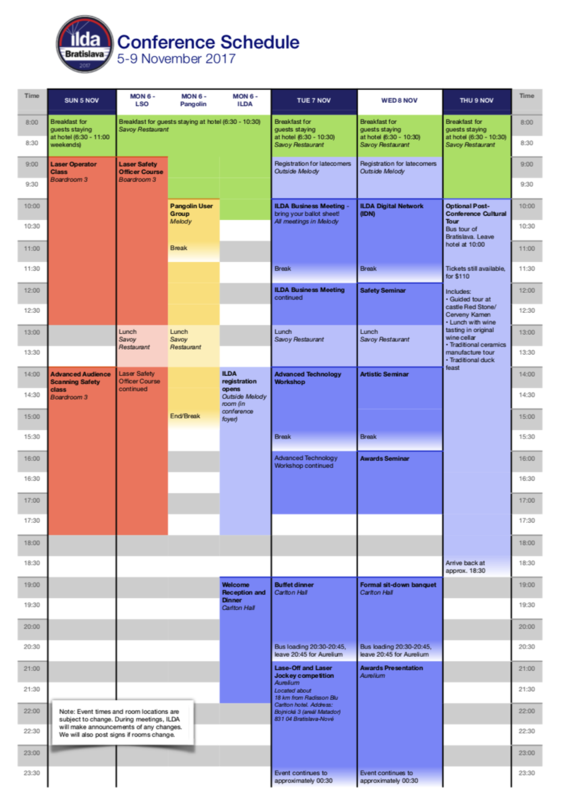 For a schedule of events, see one of the pre-conference pages from a recent Conference, such as Bratislava or Baltimore. There will be a PDF schedule that you can download to review typical events. Traditionally, the day after the last official Conference event — usually the Awards Presentation — there is a cultural tour. This allows ILDA Members to “see the sights” and to spend time together informally. Most of these have been bus tours, although in a city a walking or subway tour may be appropriate. The host should contact local tour companies to find out what they have available, and provide this information to ILDA. ILDA and the host will jointly select a tour. ILDA pays for the tour from money collected from tour participants. ILDA and the host will sign a contract laying out each side’s rights and responsibilities. Click here for a PDF of the contract. In the early 2000’s, L. Michael Roberts — a host of the 1996 ILDA Conference — wrote a 46-page document called “So You Want To Host an ILDA Conference…” The most recent version was printed around 2006. Some of the information may be outdated. Other information, such as about hotel amenities, is now handled or selected by ILDA rather than by the host. But you still may find some information in this document useful, so we are providing a link here.